Unidentified collector (Lugt 474, once identified as Pierre Crozat, now called "faux Crozat"). Dr. Anthony O'Brien, Dublin (sale, Sotheby's, London, 10 December 1968, no. 18). P. & D. Colnaghi, London; NGA purchase in 1977. 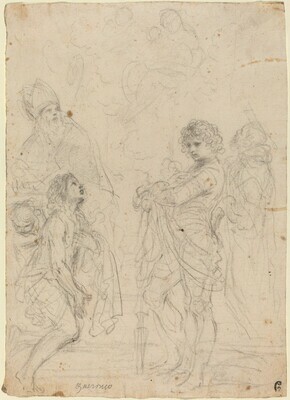 Giovanni Francesco Barbieri, Il Guercino (1591-1666), Disegni, Pinacoteca Nazionale, Bologna, 1991, no. 141 (Denis Mahon). Mahon, Denis, IL GUERCINO, DIPINTI, (exh. cat.) Bologna: 1968, p.201. Salerno, Luigi. I Dipinti del Guercino. Rome, 1988: 358, under no. 288. Loire, Stéphane. Exh. cat. Le Guerchin en France. Paris, 1990: 76, fig. 46. Stone, David. "Supplement, Guercino Drawings in North American Collections, A Selective Checklist," in exh. cat. Guercino, Master Draftsman, Works from North American Collections. Harvard University and elsewhere, 1991: 222, no. 161, plate A.